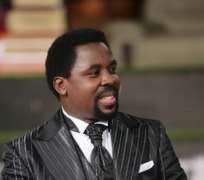 The founder of the Synagogue, Church of All Nations (SCOAN), Prophet TB Joshua turns 46 on June 12th 2009. Prophet Joshua, who began his ministry about 20 years ago, was born in Arigidi-Akoko, Ondo State, Nigeria. His is a unique sort of healing and prophecy ministry that combines preaching the gospel with extensive charity work on such a large scale that puts his ministry at the services of all, irrespective of creed or race. Speaking to a large congregation at The Synagogue Church last Sunday, Prophet Joshua enjoined the faithful to be true to the teachings of Jesus Christ by always giving to the less privileged. This is in keeping with his policy of “spend more on others and less on ourselves”. To celebrate his birthday this year therefore, the prophet asked all who would have given anything to contribute to his birthday, to put such gifts together and give them away to the needy, rather than to himself, as he celebrates his 46th birthday. He also said that anyone who wished to make paid newspaper announcements to congratulate him on the occasion should monetise such gestures and give them away to the under-privileged. The prophet reflected on his own life by playing back a recorded video of his early ministry, his 40-day and night fast at the prayer mountain and the hardships he went through to build his first, second and third churches, which were all destroyed by the elements. It was a heart-rending story from which Pastor Joshua encouraged the congregation to learn the lessons of the hard knocks of life.